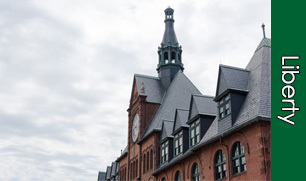 The historic Central Railroad of New Jersey Terminal (CRRNJ), a grand setting for much of New Jersey's transportation history in the northeast, sits prominently at the north end of the park. A two-mile promenade, Liberty Walk links the picnic area, Interpretive Center and the CRRNJ Terminal while presenting visitors with a sweeping view of the Hudson River. An outdoor performance area and other improvements mark the northern section of the park, while the western portion is dominated by the state-of-the-art Liberty Science Center. Liberty State Park's recreational facilities are partially accessible for persons with disabilities. Please contact the park office for further information regarding disability access. Text telephone (TT) users, call the New Jersey Relay Service at (800) 852-7899. Shuttle buses are currently NOT operating in the park until further notice. The park is open, but the Nature Interpretive Center Building is still closed due to Hurricane Sandy storm damage. The CRRNJ Terminal is closed Christmas Day, December 25. Nature Interpretive Center remains closed. The "Empty Sky" 9/11 Memorial is the official State of New Jersey's Memorial that honors the memory of the 749 people that lived in or had ties to New Jersey that lost their lives at the World Trade Center on September 11, 2001. The names are placed randomly on the twin brushed stainless steel walls. Individuals' names (4 inches tall) are within reach and engraved deep enough for hand rubbing. 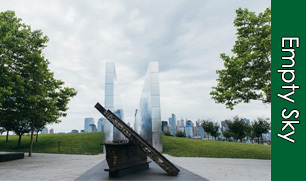 The memorial, designed by Jessica Jamroz and Frederic Schwartz, was dedicated on September 11, 2011, the 10-year anniversary. The brushed stainless steel twin walls are 210 feet long, the width of each side of the World Trade Center Towers. They rise 30 feet, standing parallel to each other with a 12-foot wide paved path of bluestone between them. Like the World Trade Center, the stainless steel reflects the constantly changing light of day. The memorial invites visitors to literally and metaphorically look toward the empty sky in memory and look forward as a community. The Empty Sky Memorial is open to the public but minor repair work will be scheduled due to Hurricane Sandy damage. 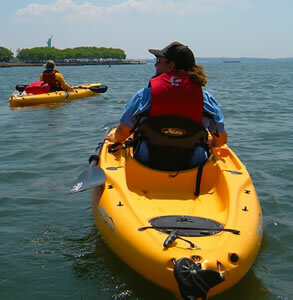 Come explore the natural beauty of the Hudson River Estuary by kayak. Tours will embark from the canoe/kayak launch located at the south side of Liberty State Park near the park office and will highlight the local wildlife and habitats of Caven Point. Trips will run approximately two hours and will include a brief safety and paddle instruction. No prior paddling experience is required, however, participants need to be comfortable navigating in relatively deep water. Life Jackets (PFDs) will be provided and are required. This program is appropriate for adults and children 16 years and older. Children 16 and older need to be acompanied by a legal adult. For registration and payment information, or any other questions, please contact Liberty State Park at (201) 915-3400 x202. Space is limited and pre-registration is required. All programs run from 10 a.m. to noon. Please plan to arrive 30 minutes prior for check-in. Schedule is subject to change. Liberty State Park off ers a variety of recreational uses. Take advantage of the miles of walkways by walking, jogging, biking, or rollerblading. Get fit with the par course that runs along Freedom Way. Bring your binoculars and look at the numerous species of birds which frequent the park. You may also bring your family and picnic at one of the playgrounds. There is always a nice breeze for flying a kite, or you may enjoy the waters by fishing or crabbing, boating or kayaking. Hop on a ferry and visit the Statue of Liberty and Ellis Island, or stop by and participate in one of our Natural or Historical Interpretive programs. Find out about events and happenings at the park by downloading the latest edition of The Green Oasis the official Liberty State Park newsletter. Hunting is prohibited in and around Liberty State Park, including the waters surrounding the park, at all times. The Liberty Science Center provides endless opportunities for exploration and discovery. The center hosts nine permanent exhibition galleries integrating science and technology into all facets of our lives. They also have the nation's largest IMAX dome theatre, and offer lots of hands-on science and programs for all ages. The CRRNJ Terminal is open to the Public. The hours of operations: July 1 through Sept 5 will be 7:30 am to 5:00 pm. From 1892 through 1954, the CRRNJ Terminal stood with the Statue of Liberty and Ellis Island to unfold one of this nation’s most dramatic stories: the immigration of northern, southern and eastern Europeans, among others, into the United States. After being greeted by the Statue of Liberty and processed at Ellis Island, these immigrants purchased tickets and boarded trains at the Terminal that took them to their new homes throughout the United States. 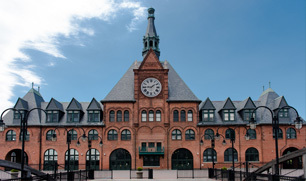 Learn more about the CRRNJ's history, visit the Historic CRRNJ Train Terminal site. The Interpretive Center at Liberty State Park is an environmental and historical education facility located on Freedom Way. Open year round the center features exhibits focusing on the natural history and ecology of the Hudson River Estuary and offers programs for school and community groups and the general public. The center also offers a variety of Professional Development Workshops for formal and non-formal educators. The Nature Interpretive Center remains closed for renovations; however, environmental education programs are still being offered. For more information, please call (201) 915-3400. Find out about events and happenings at the park by downloading the latest edition of The Green Oasis - the official Liberty State Park newsletter. A Special Use Permit is offered by Liberty State Park to accommodate specific activities or events that fall outside of the scope of normal Park usage. Special Use Permits cannot be issued to individuals or for personal celebrations, but rather to formal organizations, such as non-profits, for-profit companies, institutions and government entities. Examples of a special use are press conference, commercial filming, corporate event, non-profit fundraiser, festival, fireworks show, demonstration, concert, televised event. etc. A completed application must be submitted to Liberty State Park for review, at least 90 days prior to the event. If the special use or event is large or complex, at least one-year’s prior notice is recommended. 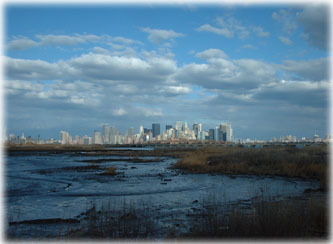 Adjacent to the Interpretive Center lies a 36-acre state Natural Area consisting mainly of salt marsh, one of the few remaining tidal marshes of the Hudson River Estuary. A self-guided nature path offers opportunities to observe and experience this unique wildlife habitat. Picnic Reservations for 2019: Liberty State Park is now taking reservations for the free group picnic areas for the 2019 season. The Upper New York Bay and Hudson River offer excellant opportunities for fishing. Common species include bluefish, shad, striped bass and blue claw crabs. Fishing and Crabbing are permitted in accordance with New Jersey's Fish and Wildlife Laws. Consumption advisories may exist for certain species. For more information, contact the park office. Please dispose of all stray fishing line properly. Liberty State Park’s boat launch provides access to the Hudson River and opens at 6 a.m. throughout the year. Fees: Permits are mandatory year round. For fees please inquire at the park office. Maximum trailer length is 23 ft.
Place of Purchase: Seasonal launch permits must be purchased at the park office, and are accepted at both Liberty State Park and Leonardo State Marina. Daily launch permits may be purchased at the office or at the ticket machine in the boat launch. Kayak Launch Site: The kayak launch site is free. Contact park office for location and additional information. Ferry service from Liberty State Park to Ellis Island and the Statue of Liberty is available throughout the year. Tickets may be purchased at the ticket office located near the CRRNJ Terminal. Nearby parking is available for a fee. To purchase tickets and more information call 1.877-LADYTIX (877-523-9849) or visit, statuecruises.com. Liberty State Park offers a variety of programs including those for schools, colleges, and organized groups. We also provide Professional Development Workshops for formal and non-formal educators. These programs are available at the Interpretive Center and the Central Railroad of New Jersey Terminal. For more information about our Educational Programs visit Liberty State Park's Education page.